with Metal Earth Research Associate, Zsuzsanna Tóth. 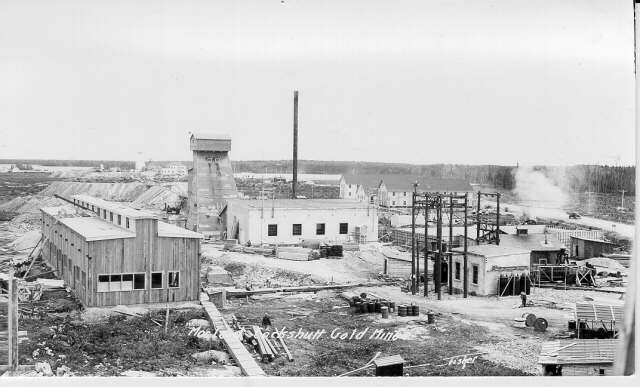 Image: MacLeod Cockshutt Gold Mine (~1934). Source: Harry Fisher, Greenstone Public Library. The Geraldton-Onaman transect covers the northern part of the metasedimentary Quetico subprovince, the Beardmore-Geraldton and Onaman-Tashota greenstone belts of the eastern Wabigoon subprovince. Orogenic gold deposits across the Beardmore-Geraldton belt produced over 4.1 Moz Au over the past century and significant resources remain (e.g. Hardrock deposit, Geraldton, ca. 6.4 Moz) in this belt. In others parts of the Quetico and eastern Wabigoon subprovinces, significant base and precious metal deposits are yet to be discovered. Therefore, the Geraldton-Onaman transect is considered one of the poorly metal-endowed transects of Metal Earth. Understanding the geological evolution of our transect and comparing it to that of the well-endowed Abitibi greenstone belt is a crucial step in explaining the spatial and temporal distribution of base and precious metal deposits worldwide. The Geraldton-Onaman crew is starting its second field season this summer. The team will primarily be studying the northern part of the transect focusing on igneous and sedimentary rocks. At the end of the 2nd year of transect research, all field observations will be compiled with geochemical, geochronological and geophysical data from the study area. “If you look at the extent of the eastern Wabigoon subprovince, it is stunning to realize how a significant portion of it has barely or never been studied. It is quite amazing when you are among the first few people who are interested in studying certain lithological assemblages and the related research questions. We are looking at the area from a deeply scientific point of view and focusing on the geological processes that contributed to the development and evolution of the eastern Wabigoon and Quetico subprovinces between ca. 3.5 and 2.6 Ga."
- Zsuzsanna Tóth, Research Associate. “The evolution of these protocontinents is complex. The nucleus of the eastern Wabigoon subprovince is close to 3.0 Ga old but there is evidence for inheritance from even older pre-existing continents in the area. Volcanism was intermittently active for at least 250 million years, from 2.97 Ga to ca. 2.72 Ga.
– Zsuzsanna Tóth, Research Associate. How did the eastern Wabigoon and Quetico subprovinces form and evolve? What type of geodynamic processes explain the accumulation of the volcanic packages? What deformation and metamorphic events affected the plutonic, volcanic and sedimentary rocks? Zsuzsanna is from Esztergom, Hungary and completed her PhD at Laurentian University and MSc at Eötvös Loránd University in Budapest, Hungary. Her research interests are in Precambrian geology with a focus on structural geology, economic geology, igneous petrology and detrital zircon geochronology. Keaton is from Mississauga, ON and completed his MSc at Laurentian University. His research interests are in volcanology, economic geology, tectonics and Precambrian geology. Anna is from Airdrie, AB and completed her BSc at the University of Calgary. Her research interest is in metamorphic petrology.